Here we describe an interdisciplinary and multi-country initiative to develop rapid, participatory methods to assess the vulnerability of coastal communities and facilitate adaptation to climate change in data-poor regions. The methods were applied in Madagascar as a case study. The initiative centered on an exploratory research exercise in two communities in the south-west of Madagascar, a workshop held in Antananarivo in June 2016, combined with a component on communicating ocean science and climate change to stakeholders. It utilized innovative and rapid approaches to combine global and local skills and information on adaptation and resilience building, taking cognizance of national policies, and was based on the principles of a holistic, integrated and participatory approach. This paper summarizes the activities undertaken and assesses how effective they were in achieving the project goals, as well as presenting examples of the outputs obtained. The activities demonstrated the value of using existing high resolution global climate models for provision of information on future trends, and of including a traits-based ecological risk assessment as a standard component of vulnerability assessments. User-friendly qualitative modeling activities helped to consolidate holistic, integrated understanding of selected fisheries. The value of assessing the importance and resilience of supply chains and taking the local management measures and institutions into account were validated. The outcomes of the initiative reinforced the principle that the cumulative ecological and social impacts of individual stressors and drivers on marine-dependent communities must be addressed, including climate-change related stressors. Assessments of vulnerability and adaptation planning should be forward-looking and consider likely changes in the future. They must also be done with participation by local experts and stakeholders to ensure knowledge exchange, local capacity-building and ownership and that outputs are rooted in the local realities, are accepted as being legitimate, and reinforce and complement relevant legal frameworks and laws. The dynamics of the oceans are driven by the climate. Climate controls ocean temperatures, stratification and circulation as well as nutrient supply and exposure to sunlight, which in turn influence marine ecosystems. Climate change has already led to increases in ocean temperature and acidification, sea level rise, expanding hypoxic zones and other negative environmental changes and these trends will continue in the coming decades (Cochrane et al., 2009; Pörtner et al., 2014). Coastal communities are also impacted by climate, both directly through, for example, storm surges and other extreme events and indirectly through climate-driven changes in abundance, productivity and distribution of marine species important for their livelihoods (Pörtner et al., 2014; Brander et al., 2018). Many climate-driven changes to marine ecosystems are occurring most rapidly in regions of the ocean that are warming the fastest (Poloczanska et al., 2013). The 24 fastest warming marine areas have been identified from historical observations of sea surface temperature (SST) and have been designated as marine hotspots (Hobday and Pecl, 2014; Hobday et al., 2016b). A number of studies have been undertaken or are underway on changes in some of the hotspots and information from those studies is being exchanged through the Global Marine Hotspots Network1 that was established in 2010 and has helped to fuel interest in these regions (Pecl et al., 2014a). One of the identified hotspots is the Mozambique Channel between Madagascar and Mozambique. Madagascar, the subject of this paper, is located in the south-west Indian Ocean and has a total surface area of about 590,000 km2. It has a population of approximately 21 million, which is growing at an estimated 2.9% per year. In terms of the Human Development Index (HDI), Madagascar was ranked as 158th out of 188 countries in 2015 (UNDP, 2015). Approximately 70% of the population lives below the poverty line and approximately half are totally dependent on natural resources for their subsistence. The nation’s fisheries are predominantly small-scale, occurring mainly in the south-west and north-west of the country where there are limited other opportunities for livelihoods. Many coastal communities are therefore heavily dependent on fishing and coastal ecosystems for their livelihoods (Harding, 2013). In 2003, over half of the Madagascan population was living within 100 km of the coast and 10% within 30 km of reefs (Burke et al., 2011). In this context, marine resources are of critical importance for many coastal communities (Le Manach et al., 2012), providing food security and incomes for many of them. The impacts of climate change on the inshore areas of Madagascar and the coastal communities are one more challenge that must be faced on top of other drivers that are already threatening fishery resources and inshore ecosystems. These include over-exploitation, coastal degradation, run-off sedimentation from unsustainable land-based practices, weaknesses in governance and management of resource utilization, and others. In 2010, Madagascar adopted a National Policy against climate change, which aims to reinforce national resilience to climate change, reduce national vulnerability and develop approaches for low carbon emissions (FANRPAN, 2014). A National Adaptation Plan is currently under preparation and the process will involve all stakeholders in identification of the needs and priorities for adaptation to climate change (N. Ramaroson, personal communication). The project Global Learning Opportunities for Regional Indian Ocean Adaptation (GLORIA) was developed primarily to contribute to existing efforts by Malagasy governmental and non-governmental agencies (NGOs) to assess the risks to coastal communities and facilitate the development of plans for adaptation to climate change. It was also anticipated that the approach developed and tested in GLORIA would be relevant to other countries in the western Indian Ocean and comparable developing countries world-wide. The United Nations Framework Convention on Climate Change (UNFCCC) calls for special consideration to be given to developing countries that are particularly vulnerable to negative impacts of climate change and calls on Parties to “cooperate in preparing for adaptation to the impacts of climate change; develop and elaborate appropriate and integrated plans for coastal zone management….” (Article 4, UNFCCC, 1992). The vulnerability of any social-ecological system to climate change is determined by the extent to which the system as a whole, including the geo-physical, biological and socio-economic components, are exposed to negative impacts of climate change and are unable to cope with those impacts. Assessments of vulnerability to climate change are aimed at informing the development of adaptation policies and actions aimed at reducing risks associated with climate change (Füssel and Klein, 2006). Vulnerability assessments need to consider, amongst other factors, how different individuals derive wellbeing from their natural coastal environment and the ecosystem services it provides. Whilst there has been a lot of research on unpacking the complex relationship between ecosystem services and wellbeing (Carpenter et al., 2009; Raudsepp-Hearne et al., 2010; Vihervaara et al., 2010) much of this has been based on snapshots in time and little has been done to examine how communities will be affected by future changes to the environment (Bennett et al., 2015). A crucial tool for studying the potential impact of predicted future change is through vulnerability assessment, and the concept of vulnerability has emerged as a central organizing concept for research on climate change (Polsky et al., 2007). Vulnerability frameworks in different formulations have been empirically applied to a number of coastal communities in different regions of the world (e.g., Allison et al., 2009; Gough, 2012a; Cinner et al., 2013; Harding, 2013; Whitney et al., 2017; Sowman and Raemaekers, 2018). In the IPCC framework, vulnerability is assessed as a composite function of exposure to climate-driven impacts, sensitivity to climate impacts, and capacity to adapt (e.g., Allison et al., 2009; Cinner et al., 2013; Bennett et al., 2015; Himes-Cornell and Kasperski, 2015). Vulnerability assessments have to be sensitive to change in the ecological as well as the human domain for policy makers and managers to be able to prepare effectively for the consequences (Maina et al., 2016), which requires assessments of the linked social–ecological systems (Turner et al., 2003; McClanahan et al., 2008; McGinnis and Ostrom, 2014). In recognition of this need, the basic IPCC framework has been expanded to encompass the vulnerabilities of both the ecological and social dimensions (Marshall et al., 2009; Cinner et al., 2013). The IPCC framework has been widely applied and is unquestionably a valuable tool but is not globally accepted as being the definitive approach and there is considerable critical thinking about how best to approach vulnerability assessments within different contexts (Cutter et al., 2003; Füssel, 2007; Preston et al., 2011; Preston, 2012; Bennett et al., 2015; Sowman and Raemaekers, 2018) and there are a number of extant different approaches (e.g., Cutter et al., 2003; Schröter et al., 2005; Karim and Mimura, 2008; Blythe et al., 2014). In this paper we describe the application of rapid, participatory methods designed to assess the vulnerability of coastal communities and to inform adaptation planning. These methods collectively incorporate the features of the integrated ecological and social IPCC vulnerability assessment framework but with modifications to reflect local knowledge, conditions and availability of information. The GLORIA initiative centered on an exploratory research exercise in assessing local perceptions of climate change using participatory mapping, semi-structured interviews and a questionnaire in two communities in the south-west of Madagascar, a multi-stakeholder workshop held in Antananarivo (Figure 1) in June 2016, and a complementary activity on communicating ocean science and climate change to communities and stakeholders. Figure 1. Map of Madagascar showing the sites of two workshops and of Ambola and Ambotsibotsike, the two fishing communities that participated in the field surveys undertaken through the GLORIA project. The exploratory research exercise undertaken in two communities in Toliara province in south-west Madagascar (Figure 1) took place over a week during which a vulnerability assessment was undertaken and local perceptions of environmental and climatic change were identified through interviewing and participatory mapping. This provided new in situ information for use in the main workshop to supplement that already available from earlier work in the country and from global experience. The workshop on communicating ocean science was held in Toliara, on the south western coast of the country (Figure 1), focusing on the theme of communicating ocean science and climate change and addressing topics such as ocean and climate literacy needs, consideration of how learning happens and fundamental ideas about learning. Figure 2. The methodology applied in the different activities undertaken in the GLORIA project and the socio-ecological scope of each activity and, where relevant, its sub-components. 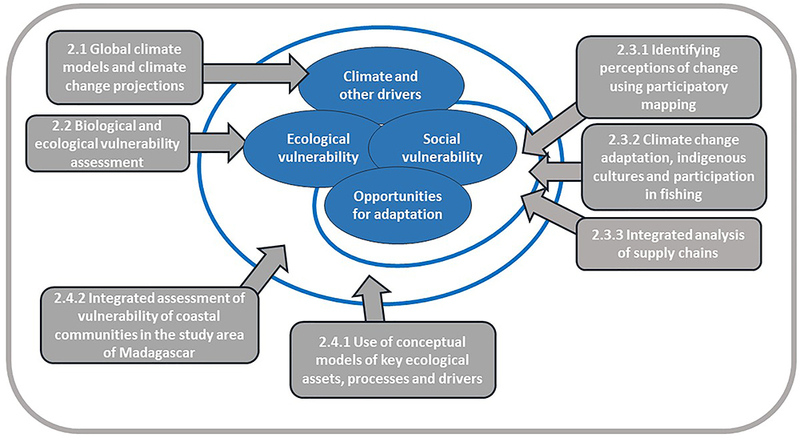 Elements of socio-ecological vulnerability and adaptation are shown in blue, and activities and sub-activities addressing individual or aggregated elements of vulnerability/adaptation are shown in gray boxes. Numbers refer to the section under Materials and Methods providing details of the activities. A separate activity on communicating ocean science and climate change to communities and stakeholders was also undertaken but did not form a part of the vulnerability assessment and is not shown here. o Consideration of supply chains (case study). o Integrated assessment of vulnerability of coastal communities in the north and western regions of Madagascar to climate change. There was also a fifth activity, that on communicating ocean science and climate change to communities and stakeholders, which is treated separately as it was not integrated into the vulnerability assessment and exploration of adaptation options. An outline of the methods for each of the separate activities is provided in Sections “Global Climate Models and Climate Change Projections” to “Communicating Ocean Science and Climate Change” below. The GLORIA project underwent an Ethics Assessment by the funding agency, Ecosystem Services for Poverty Alleviation (ESPA), and was approved, prior to receiving the funding. ESPA ran from 2008 to 2018 and was a global interdisciplinary research program based in the United Kingdom and funded by the UK Natural Environment Research Council. GLORIA was designed and implemented as a partnership between local agencies and stakeholders and an international team. As such, the project was not intended to obtain information from local participants but to exchange information and ideas and develop solutions together. All the participants at the workshop in Antananarivo understood this and participated voluntarily. The workshop in Toliara on communicating ocean science and climate change was organized together with staff at the Institut Halieutique et des Sciences Marines (IH.SM) of the Université de Toliara, who identified and liaised with participants, explaining to them the goals and approach of the exercise. This workshop did not involve obtaining information from participants, who volunteered to participate, but provided them with information and materials that were potentially useful to them. They could subsequently choose whether or not to use them in the future. The third major activity of the project was the assessment of local perceptions of climate change in two communities in the south-west of Madagascar. This exercise was done in association with IH.SM and WWF Madagascar, both of which have extensive experience in working and interacting with local stakeholders. These two organizations selected the two communities to participate in the activity and ensured that the individuals involved were well informed on the purpose of the activity and how it would be implemented and that they were willing to participate. Participation was fully voluntary and followed university ethics criteria. An important criterion in selecting the two communities was that they were not considered fatigued by other research projects also conducting interviews in the south-west region. Participants in the project whose contributions and input to this article met the criteria for authorship, in line with the International Committee of Medical Journal Editors guidelines, were included as authors of the article. Information from global ocean models is very complex and numerous characteristics need to be translated into a form that matches the specific, local needs. This activity used a participatory approach that combined climate science with local data, knowledge and perceptions to develop a set of regionally applicable metrics that can be extracted from the climate models. A high resolution global ocean circulation model coupled with a biogeochemical model, run under the RCP 8.5 scenario, was used. The first step involved the retrieval of the most generic climate change indicators, physical and biogeochemical, relevant for living marine resources, analyzed in Popova et al. (2016a) and van Gennip et al. (2017), and where possible, underpinned by the climate change impact assessment (IPCC WG2). This step was also guided by region-specific reports of Obura et al. (2012) and Harding (2013). The climate change indicators included long term SST trend, changes in ocean circulation, ocean productivity, acidification, deoxygenation, precipitation and sea level rise. These indicators were presented, discussed, revised and developed further in collaboration with national and international experts with knowledge of Madagascar’s living marine resources and the communities that depend on them. The main goal of working with local expertise was to develop more regionally applicable indicators of climate change than those routinely extracted from the climate models. Such indicators, related to the main climatic stressors, were identified during discussion sessions, along with recommendations to the climate modeling community. Vulnerability assessment is not a new topic to Madagascar and the NGOs Blue Ventures and WWF Madagascar have compiled a report on the methods for assessing the vulnerability of traditional Western Indian Ocean fisheries to climate change (Gough, 2012a). Included in that methodology is an ecological assessment, a fisheries landings assessment and a socio-economic assessment in which susceptibilities are established using key indicators with respect to exposure, sensitivity and adaptive capacity variables. This is useful in allowing scores to be compared between sites to determine which sites should be prioritized. 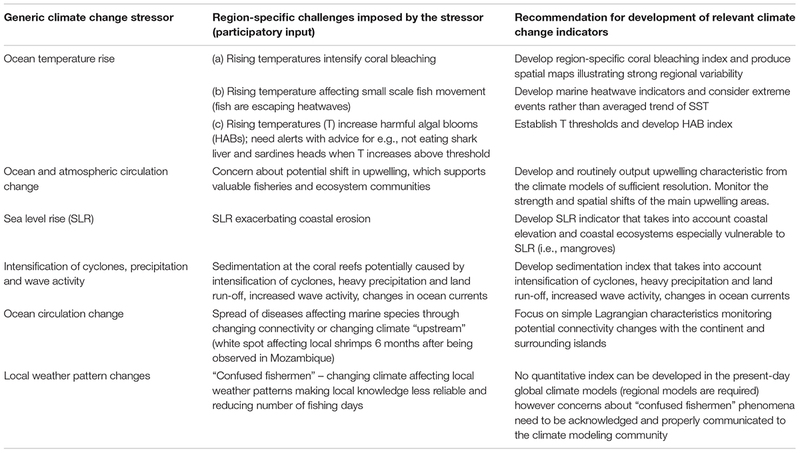 In a constructive review of this methodology, Harding (2013) noted that the current method is designed to assess the impact of climate change on fisheries, particularly on reef fish populations, but is not able to assess the likely impacts of other climate stressors, which could also impact on other species or fish habitats. Other fishery targets in the same ecosystem, such as invertebrates and non-reef finfish, are currently also not part of the local vulnerability assessments. Harding (2013) provided a number of suggestions to improve the methodology for this specific combination of ecosystems, climate stressors and fisheries in Madagascar, including to modify the methodology to assess particular target species or assemblages (e.g., shrimp, lobster, sea cucumber, shark, octopus) rather than, or in addition to, constructing a vulnerability assessment for the whole ecosystem in question. The rapid fisheries species sensitivity assessment (as per Pecl et al., 2014b) is a useful complement to the methods already employed by WWF in the Western Indian Ocean Region, as it can identify priority fishery species for further study and resource allocation. The value of this type of approach in identifying knowledge gaps and priority species for further ecological assessment was demonstrated on key Australian fishery species (Pecl et al., 2014b; Welch et al., 2014; Caputi et al., 2015). The rapid sensitivity assessment method estimates the ecological sensitivity of species to climate change based on those traits or attributes of each species that indicate the potential for changes in abundance (measures of potential for biological productivity), distribution (measures of the capacity of a species to shift) and phenology (measures of potential impact on timing of life cycle events). Each attribute for each species is assigned a score of 1 (low sensitivity) to 3 (high sensitivity). Overall sensitivity was calculated as per the following logic rules: High = 5 or more attributes scoring ‘high,’ Medium-high = 4 attributes scoring ‘high’ and 3 or more scoring ‘medium,’ Medium-low = 2 or 3 attributes scoring ‘high’ and 3 or more scoring ‘medium,’ Low = 4 or less attributes scoring ‘medium’ and ‘high’ OR only 1 attribute scoring high with the remaining attributes scoring medium or low. These logic rules were based on those used in a similar sensitivity assessment of South African fisheries species (Ortega-Cisneros et al., 2018b). 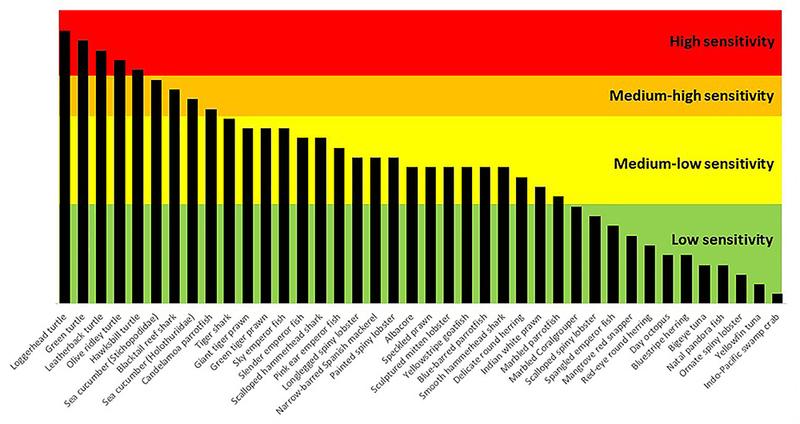 Species were ranked according to the number of attributes assigned high, medium and low scores. This traits-based sensitivity is transparent, repeatable and rapid, and thus can quickly identify priority species that are likely to be most sensitive to drivers of climate change. It is particularly useful in data or resource limited situations. However, the precise sensitivity threshold of each trait is usually unknown, and all traits are weighted equally when the weighting or choice of traits may not be appropriate for all species. In this activity, the vulnerability of coastal communities in Madagascar to ongoing climate and human-driven environmental changes was assessed through perception and participatory mapping surveys conducted in situ as an experimental exercise. In June 2016, immediately prior to the Antananarivo workshop, a 7-day fieldtrip was conducted to two fishing communities in the vicinity of Toliara: Ambola and Ambotsibotsike, where a total of 48 interviews were administered. A focus group method was used for participatory mapping, semi-direct interviews for evaluating peoples’ perceptions of climate change and questionnaires for the socioeconomic vulnerability assessment. The full questionnaire can be found at http://gullsweb.noc.ac.uk/communitysurvey.php and a detailed description of the method in Aswani et al. (2018). The participatory GIS mapping exercise covered topics such as the present and historic governance of marine resources in the area, mapping of local resource classification, distribution of habitats and their local names, allocation and tenure (if any), areas for fishing, changes that have been observed in the last 25 years, and others. The results from the fieldtrip were presented to and discussed by participants at the workshop in Antananarivo. This activity sought to understand the vulnerability of individuals to future environmental changes. The method undertaken encourages participants to think holistically about the costs and benefits of environmental change, to consider the potential winners and losers that would arise out of the situation and to determine those most likely to be vulnerable. In the first part of the activity, the concept of vulnerability, wellbeing and the theory of human need was re-introduced with a specific focus on social and economic vulnerability of Malagasy communities. Recent work carried out by the SPACES project2 in eastern Africa was also presented. The objective was to encourage stakeholders to think more broadly about how different individuals derive wellbeing from the environment. The second half of the activity involved discussions with stakeholders on the socio-economic impacts of three different plausible future scenarios involving warming SSTs, increasing droughts and increasing wind intensity and frequency. Techniques such as scenario planning have been argued to be powerful for dealing with complex socio-ecological sustainability challenges and can enrich environmental management (Carpenter et al., 2006; Kahane, 2012). These scenarios were based on convener presentations of previous activities (notably the climate change projections and ecological modeling activities) and discussions amongst stakeholders that arose consequently within sessions and during coffee breaks. These different scenarios were discussed in terms of the potential repercussions of the changes on wellbeing, the winners and losers in the communities that would arise from such scenarios, as well as potential adaptation strategies to such stressors and events. Finally, this led to discussions on ways to improve or facilitate appropriate responses to stressors and shocks and therefore increase adaptive capacity to future environmental changes. A holistic approach to determining vulnerabilities to climate change impacts is key to effective adaptation. Whether it concerns decision-makers, industry, or community members, understanding of the fisheries value chain is critical (Hamilton-Hart and Stringer, 2016). There are many urgent questions about supply chains, such as equity, participation (e.g., Fabinyi, 2013), and waste (Love et al., 2015) that will be crucially impacted by other stresses such as overfishing and climate change (Hamilton-Hart and Stringer, 2016). Supply chains start with the fishers who catch the resource and end with fish consumers in the domestic or export markets, and include all stages in between (De Silva, 2011). The length, diversity and complexity of supply chains may impact their resilience to changes and shocks (Plaganyi et al., 2014). An integrated overview of Madagascar’s coastal resources, dependencies and vulnerabilities would be incomplete without consideration of the fisheries supply chains (see also Rasolofonirina and Conand, 1998; Rasolofonirina et al., 2004; Rasolofonirina, 2007; McVean et al., 2005; Lavitra et al., 2008; Indian Ocean Commission, 2015; Rocliffe and Harris, 2015, 2016). 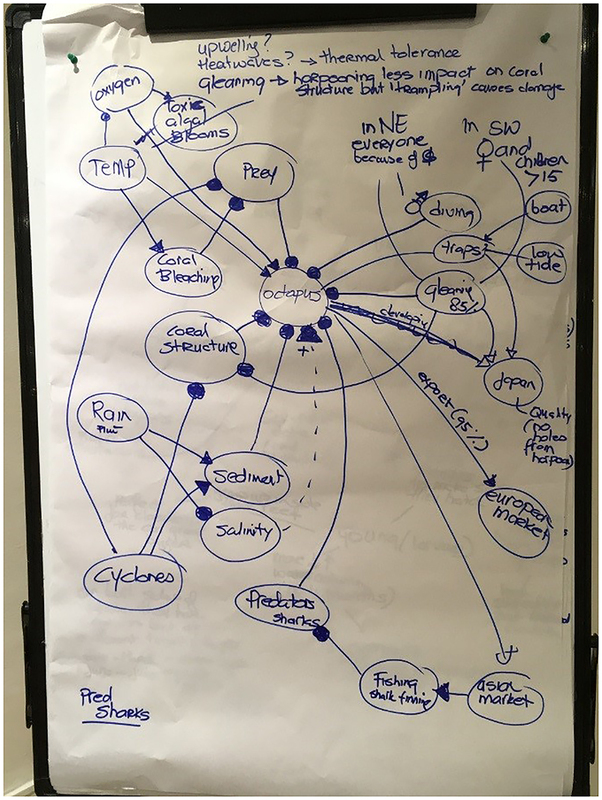 Ways to map the supply and consider supply chain dependencies, interactions, and vulnerabilities to climate change impacts were illustrated to workshop participants. In consultation with workshop participants, information on fisheries supply chains was gathered for two Madagascar case study fisheries: the crab and octopus fisheries. However more detailed information was provided on the more complex crab fishery and hence this example of supply chain analysis is presented in this paper. After illustration of the conceptual modeling approach (see The Use of Conceptual Models of Key Ecological Assets, Processes and Drivers) participants contributed their knowledge of the crucial logistics and links in the supply chain. 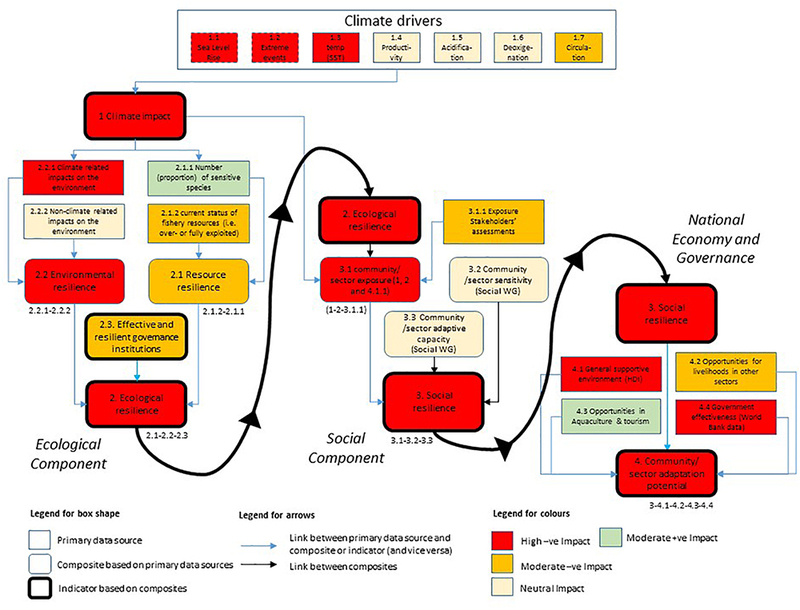 They subsequently indicated the stages in the supply chain where climate impacts were likely to be evident and which stages in the supply chains would be affected by this. This information was drawn on a white-board and later transcribed into a figure. The range of model types used in marine fisheries and ecosystem management was summarized for participants, ranging from simple to complex, qualitative (descriptive, conceptual drawing), through to semi-quantitative and quantitative (involving numbers, statistics), as well as differences in terms of whether models focus on mechanistic understanding or are dynamic process models fitted to data using statistical theory. In order to integrate the physical, biological and social aspects addressed by this study, it was noted that models differ in the level of detail in representation of physical, biological, and human complexity (Plaganyi et al., 2011). There is increasing incorporation of economic and social factors in ecological models (for example Fulton et al., 2011). Use of appropriate models can help to synthesize understanding and make predictions, as well as simulate alternative scenarios and thereby trial the impacts of management actions in a way that is difficult to do in the real world. Model development was guided by the principles used in developing Models of Intermediate Complexity for Ecosystems (MICE, Plaganyi et al., 2014) as these models are context- and question-driven and they restrict the focus to those components of the ecosystem needed to address the main effects of the management question under consideration. A key to the success of MICE, and indeed any modeling approach, is that it involves stakeholder participation and dialog. MICE estimate parameters through fitting to data, use statistical diagnostic tools to evaluate model performance and account for a broad range of uncertainties, and hence are applicable to tactical decision-making. Workshop participants agreed that there would be high value in the development of models of the Madagascar coastal biophysical systems as a means to improve understanding of system functioning and to allow for simulation of the costs, benefits and other impacts of alternative management strategies. This would help in assembling an integrated overview of Madagascar’s coastal resources, and the dependencies on and vulnerabilities of those resources. Conceptual models assist in the synthesis and communication of current understanding and knowledge of key ecological assets, processes and drivers. Such models are also a valuable tool to predict how a system will respond to disturbance or perturbation, in order to guide management interventions (Dambacher et al., 2009). Given limited time, a number of conceptual and qualitative models were developed jointly with stakeholders as a basis for later development of quantitative dynamic models. During the workshop, two qualitative, mathematical conceptual models were developed with the participants, using as examples the octopus and crab fisheries. For each example, key processes and components were identified, considering not only the focus species but also any other related species, important physical drivers and processes influencing these species, and the use and users of the resource. These nodes were drawn on a whiteboard and participants commented on the direction (negative or positive) and strength (weak or strong) of connections between components in order to develop a conceptual model of the system. Drawing a conceptual model in this way provides a framework for a more formal qualitative model (Levins, 1998; Dambacher et al., 2009). The models developed here contain only the sign (+, -, 0) of interactions between components and do not account for the strength or precise magnitude of the interaction. The octopus fishery example is used below to illustrate the insights that can be gained from a simple qualitative model. An integrated assessment of the social-ecological system of the study area was used to evaluate the vulnerability of the system as a whole, taking into account interactions between different elements and sub-components. It covers the north and western coasts of Madagascar: the area represented by the communities and stakeholders that participated in the project. There have been some assessments of the vulnerability of whole systems to climate change in the western Indian Ocean (e.g., Gough, 2012b; Cinner et al., 2013). Both of those studies focused on coral reef fisheries and the underlying frameworks and indicators used were broadly similar and consistent with the IPCC framework. The approach applied in this study implicitly covered the same elements but, because of the different habitats and fisheries in the study area, was not restricted to coral reef fisheries. The IPCC framework for vulnerability assessment is widely accepted and applied in vulnerability assessments around the world but until now there is no single methodology or framework that is accepted as the standard (See Vulnerability Assessment of Marine Socio-Ecological Systems and e.g., Karim and Mimura, 2008; Preston, 2012; Blythe et al., 2014; Bennett et al., 2015; Sowman and Raemaekers, 2018). The framework developed in this study was in the form of a conceptual model incorporating the primary drivers, elements and processes of the social-ecological system as identified by the stakeholders as being of particular importance. It took into account existing knowledge of the region and drew on the structure of the Marshall et al. (2009) social-ecological framework (see Supplementary Information). The social component of the framework follows the standard Marshall et al. (2009) and IPCC frameworks but in assessing ecological vulnerability, the approach of decomposing vulnerability into exposure, sensitivity, and adaptive capacity was not rigidly adhered to. Exposure to climate-related impacts was treated separately through consideration of climate impacts on resources and the environment but, for both simplicity and based on the information available, sensitivity and ecological adaptive capacity were implicitly combined and the information available on status and trends in resources and the environment was assumed to reflect the combination of sensitivity and ecological adaptive capacity. However, the indicator in this assessment on ‘Effective and resilient governance institutions’ is an important contributing factor to the adaptive capacity of the ecological component as a whole and was assessed explicitly. In addition to covering the ecological and social dimensions addressed in common VA approaches, the framework also considers the wider context, for example opportunities for alternative livelihoods at the national level, general governance effectiveness and the presence of a supportive environment. Factors such as these can either be almost insurmountable obstacles or important doorways to long-term resilience and opportunity for development (e.g., Allison et al., 2009; Cochrane et al., 2011b; Cinner et al., 2012; Bennett et al., 2015). The index derived from the combined effects of social resilience (incorporating adaptive capacity) and national government effectiveness is referred to in this study as community (or sector) adaptation potential. The details of the framework are presented in Section “Integrated Assessment of Vulnerability of Coastal Communities in the North and Western Regions of Madagascar to Climate Change” under Results and in the Supplementary Information. There was not enough time to synthesize all the information presented and generated at the workshop during the workshop itself and this was done after the outputs from the workshop had been assimilated. Once the conceptual model had been completed, the vulnerability status of each indicator and element was scored on a scale from -2 (high negative impact or high vulnerability) to +2 (strong positive impact or high resilience). Details are provided in the Supplementary Information. Two methods were used to aggregate the scores for composite indicators, which were utilization of a set of logic rules (Supplementary Table S1; Hare et al., 2016); and calculating the arithmetic mean of the elements or primary information included in each composite indicator. All elements and indicators were assumed to have an equal weighting but, in effect, the logic rules give a higher weighting to the more extreme values. It was not possible to give a full description of the methods and information used to develop the scores in the body of the paper and these are provided in the Supplementary Information submitted with this paper. A climate-literate citizenry is essential to build sustainable communities that are resilient to climate change and to protect fragile ecosystems. Achieving this goal requires that the communities and stakeholders understand the causes and consequences of climate and environmental change, are able to contribute their local knowledge regarding these in situ changes, and are engaged in and aware of any planning and management actions and ready to contribute to and support management recommendations. Recognizing the importance of communication and awareness creation, an integral part of the GLORIA initiative was to introduce tools and materials that could be used to increase awareness of climate change impacts in coastal populations. A workshop with about 25 participants from diverse sectors (including staff representatives from the University, students, teachers, NGOs, and city council administrators) was organized in Toliara. This was done as part of the Global Understanding and Learning for Local Solution (GULLS) project, under the Education for Climate Change Adaptation and Resilience program (see e.g., Hobday et al., 2016b). Participants at the workshop engaged in several hands-on activities and demonstrations of materials that could be used for effective teaching and learning, and a set of curricula for Grades 3–5 and 7–9, including hands-on activity kits, was provided. The workshop was designed to be relevant for diverse audiences and included both content and effective teaching and learning pedagogy materials. The immediate goal of the workshop was to provide experiences with research-based teaching and learning strategies and hands-on activities that scientists and educators can use when communicating ocean and climate science to diverse audiences (e.g., public, K–12 students, university students, other scientists). Ocean and climate literacy needs were discussed and the event focused on designing effective learning experiences ranging from topics such as the carbon cycle, greenhouse effect, ocean acidification, sea level rise, coastal pollution and fish adaptation. The materials and activity kits were used during the workshop to demonstrate their use in classrooms. A number of different challenges caused by climate change stressors were identified by participants in the project (Table 1). An upward trend in annual water temperature is the most unequivocal manifestation of climate change. However, its impacts as observed and reported by local fishers are complex and multifaceted. Rising ocean temperatures are increasing the incidence and extent of coral reef bleaching in Madagascar (McClanahan et al., 2014), and causing unusual movement of fish species in response to heatwaves, as reported by fishermen, affecting small scale fisheries. Another key concern of local authorities was increased incidence of harmful algal blooms (HABs), necessitating alerts advising against eating shark liver and sardine heads when SSTs were exceeding a threshold value. A key recommendation to the climate modeling community following this exercise is that attention needs to be given to extremes rather than just the long term trends of SST. Marine heatwaves (Hobday et al., 2016a) and coral bleaching indices appear to be the most relevant parameters for Madagascar that need to be routinely extracted from climate models. Table 1. Challenges resulting from climate change stressors identified by participants in GLORIA. Ocean circulation change is another climatic stressor strongly affecting marine ecosystems (van Gennip et al., 2017). Changes in position and magnitude of the ocean currents manifest through notable changes in connectivity between various parts of the Madagascar coast but also with the east African coast, potentially exposing marine ecosystems and local fisheries to invading species or diseases such as the white spot disease observed in the shrimp population off north-east Madagascar and carried across from Mozambique. Equally, changes in strength and location of the upwelling regions affect ecosystems as they modify the supply of cold nutrient-rich deeper waters to the surface, which maintain cool habitat and sustain the local rich biodiversity. Further stressors of climate change relevant to Madagascar include ocean acidification, for which more research is needed to understand its potential consequences for key species (Popova et al., 2016a). They also include stressors such as the intensification of cyclones, sea level rise and changes in precipitation patterns (IPCC, 2013; Knutson et al., 2015; Chen et al., 2017) which contribute to increased wave activity, floods and land run-offs. Such events can impact ecosystems, in particular coral reefs, as they increase sedimentation, smothering corals and inhibiting photosynthesis, perturb the ecosystem’s nutrient balance through large input of nutrient-rich sediment run-offs, and affect ocean currents (Table 1). The preliminary species assessment for south-west Madagascar was conducted on 40 key species, providing a benchmark to assess the usefulness of this methodology for Madagascar (Figure 3). Unsurprisingly, the most vulnerable group were sea turtles, species of which are known to nest on the shores of Madagascar where they are often subject to exploitation, and hence face other pressures in addition to those of climate change. Species considered having a medium-high sensitivity included the two sea cucumber families assessed, which may have implications for in situ aquaculture potential for this species. A positive outcome may be for octopus, which was assessed as having a low sensitivity and was also ranked amongst the least vulnerable, an important result for the growing octopus fishery in the south of Madagascar. However, given the destructive fishing method used for octopus, this potential opportunity can only be realized if non-destructive extraction methods are used, as has happened in some areas that have changed to more environmentally friendly practices. Although this first benchmarking provided an initial synopsis of potential climate change sensitivity for some marine species in Madagascar, further analysis would be useful to validate these results, also including more species, further expert opinion, and additional data as they become available. There was broad agreement, however, that the assessment methods demonstrated by the GLORIA team were useful, and would be included in the planning of future assessments in Madagascar, especially in light of the general lack of data on the species vulnerability in the region. Figure 3. Preliminary results of the Malagasy species sensitivity assessment. Despite differences in environmental and economic configuration, the most quoted change in both villages was a decrease in ‘sea product,’ i.e., marine resources, primarily fish, and fish and shrimps in mangrove areas (Figure 4). In Ambola, most of the respondents identified a human origin to this change (46% of the answers), followed by a fish technology origin (modern and efficient gears, 10% of the answers). A deterioration in benthos, i.e., dead corals, sea cucumber decrease and algae cover decrease, was also a change often cited by the respondents. Some improvements were reported, mainly induced by NGO interventions in the village and positive effects of tourism (Figure 4A). In Ambotsibotsiky, the change most cited by the respondents was a decrease of sea products. 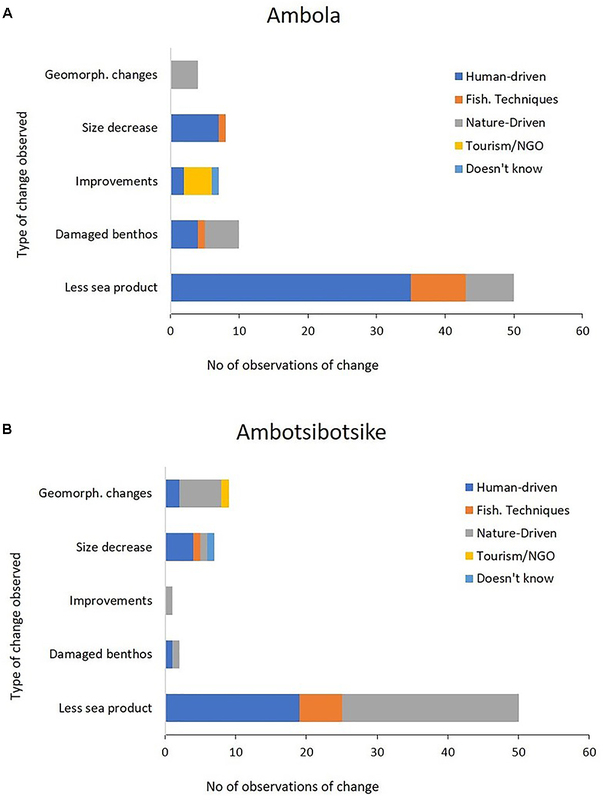 In contrast to Ambola, Ambotsibotsiky villagers identified human-driven and nature-driven causes as being equally the cause of these decreases (Figure 4B). Because of its particular configuration, i.e., settled along a mangrove ecosystem, a moving sand arrow and a lagoon, villagers living in Ambotsibotsiky reported more changes of a geomorphological nature (17% of reported changes, against 5% for Ambola), namely ongoing mangrove and lagoon sedimentation processes (Figure 5). These environmental changes appeared to be obvious to most villagers, hence explaining why so many of them mentioned nature-driven origins to changes occurring in Ambotsibotsiky. Figure 4. Types of changes against the origin of changes in (A) Ambola (n = 79) and (B) Ambotsibotsike (n = 69) in the sea environment as determined through interviews with community members. Figure 5. Perceptions of change since 1990 as report by Ambotsibotsiky community members. 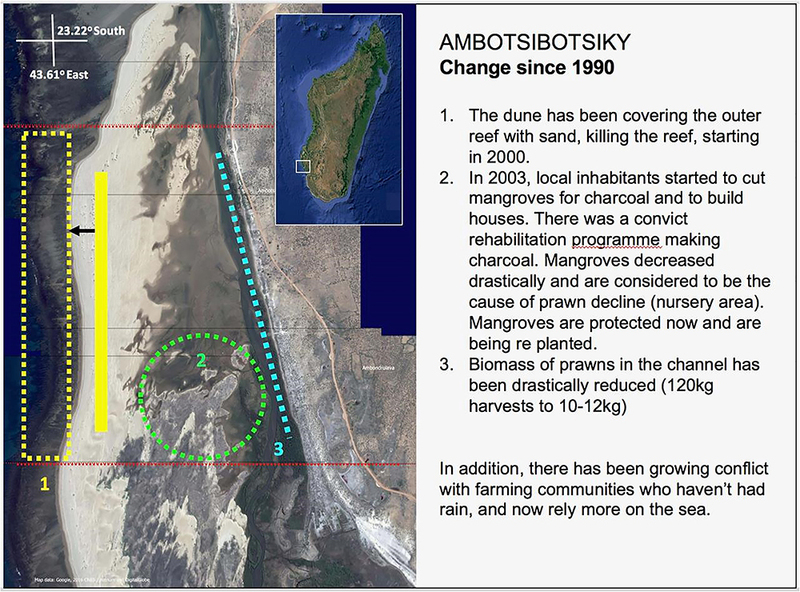 The participatory mapping exercise showed that there had been a shift in the distribution of some target species (from the reef lagoon to the fore reef area) in Ambola, and that the decline of shrimp biomass was evident in the mangrove channel in Ambotsibotsike (Figure 5). As an adaptation strategy, the respondents of Ambola said that they were adapting their fishing techniques and strategies, for example by fishing further from the shore or changing the gears they use, whereas Ambotsibotsike respondents predominantly said that there was nothing they could do. The comparative exercise between the two villages gave insights into how individual communities respond to external drivers such as the presence of NGOs. In the case of Ambola, knowledge of how to preserve catches as a tool to mitigate local vulnerability and enhance resilience to changes was evident. The perception exercise provided useful insight into how environmental changes are perceived and whether consensus exists, and it documented ongoing adaptation processes. The comparison between the two villages also showed how communities interpret changes differently according to their natural and social environment. The co-learning aspect of this activity, whereby presentations were carried out on social and economic activity and wellbeing followed by group discussions on specific topics meant that both conveners and stakeholders could learn from each other. In particular, a focus on wellbeing and winners and losers allowed participants to disaggregate impacts of future environmental change. This was reflected in the discussions where multiple different types of resource users (ranging from farmers, gleaners to traders, and those in working in tourism) and different socio-economic or demographic groups were mentioned as being affected in different ways and to different extents under the future scenarios. Similarly, a holistic wellbeing approach ensured that discussions did not solely focus around money but also about food security, shelter, health and other wellbeing dimensions. Consequently, when exploring potential adaptation strategies there was an appreciation that people may respond in different ways, which enabled a richer examination of future responses to change and their consequences on the environment. Some potential negative consequences were mentioned such as illegal mining, which was proposed as an adaptation strategy for some in response to increasing wind intensity but would have severe environmental consequences that would need to be taken into account. Taken together, the disaggregation, the multiple adaptation strategies and how these may feedback to the socio-ecological system proved useful when discussing ways to improve or facilitate appropriate responses and to increase adaptive capacity to future environmental changes. Whilst some of the recommendations proposed were less tangible (such as getting the government to help in adaptation strategies), others were more specific and could lead to enhanced resilience to future changes (such as encouraging relationships and cooperation between farmers and fishers to ensure that local ecological knowledge is exchanged to ensure sustainable techniques are used). Whilst all scenarios led to productive discussions, the potential impacts of increasing drought led to rich insights on all discussion topics and the outputs are presented here as an example (Table 2). Outputs on the other scenarios can be found in GLORIA (2016). Table 2. Anticipated repercussions of future drought on Malagasy coastal communities and suggestions as to what can be done to mitigate these effects. The crab catch sector is characterized by two main catch methods: using a pole with a hook to capture the crabs from their burrows; and use of a pot or trap with bait, which is set in the channels in the mangrove swamps. An integrated conceptual model (Figure 6) makes explicit the complexity of the supply chain and the linkages that connect the physical and biological components with the final product destination. Figure 6. Conceptual model of the crab fishery developed by participants at the Antananarivo workshop. Crab collection is of interest to people living in the north-west and south-west of Madagascar, but the abundance of crab is declining and becoming increasingly rare, particularly in the north-west, as a result of intensive crab fishing. In the south-west, mainly women and boys go fishing for crabs. A high proportion of the landed crab is bought directly from the fishers by the (mainly Malagasy) collectors. However, fishers’ wives also act as go-betweens from fish collectors (mainly their husbands), selling-on to sub-collectors. The sub-collectors separate high quality from lower quality crabs. The high quality crabs are sold to the collectors representing larger operations, who will keep the best crabs for live export. Small and low quality crabs (around 2%) are sold on the local markets. Even though the proportion of locally sold product is low, it is important in terms of nutrition and food security. Fish collectors often transport crab to the large urban centers by road (Toliara and beyond). Approximately 70% of the catch is sold to buyers or processors for subsequent export, the remainder is exported by the collectors themselves. Ten to twenty percent of the catch is suitable for live export to Asia (China), the rest is transformed, e.g., frozen, before export. Most live product is exported from Antananarivo by airfreight, the remainder is exported by vessel. The price differential between what the fishers are paid and the price received for crab export is very large. Discussions at the workshop revealed that climate change impacts mean that crab fishers are sometimes not able to go fishing because of rough and extreme weather events, thus reducing catches. However, climate impacts can also result in a catch increase. This is because shrimp is the preferred catch but shrimp fishing is more vulnerable to inclement weather, which means people will divert to the second order activity of crab fishing. Climate impacts can also delay the timing of crab sales, which can impact markets. Prices may change as a consequence of a shift in the dry season: with rains now starting in July/August instead of the usual start in October/November. Logistical disruptions from climate impacts mean that collectors will not travel to the more remote areas when there is rough weather, with several river crossings impassable at times of high rainfall. The development of the conceptual models helped to provide a holistic, integrated understanding of the fisheries. 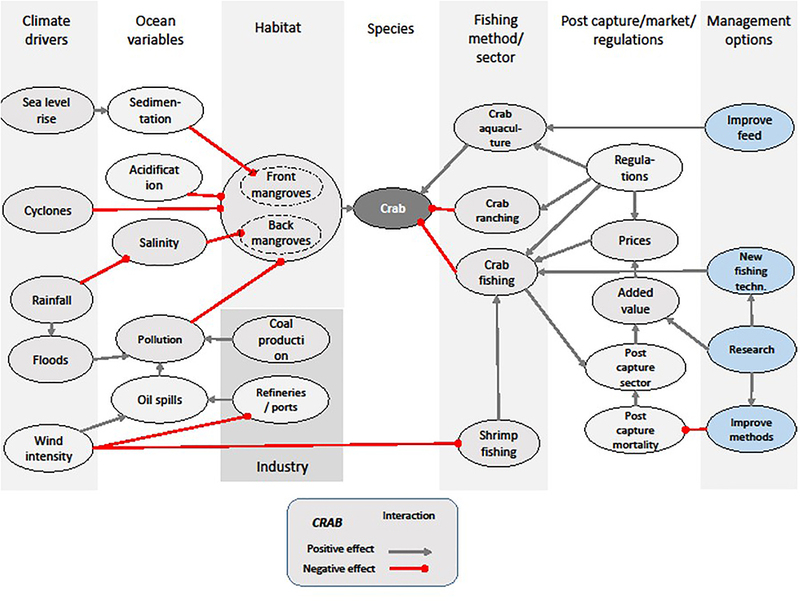 The model of the crab fishery [see Integrated Analysis of Supply Chains (Case Study), Figure 6] demonstrated the complex interactions that take place between different climate drivers and the crab fishery supply chain. The conceptual model developed for the octopus fishery demonstrates the complex interactions of climate drivers and biological responses. To illustrate the integrative approaches used in the GLORIA project, we use as an example the Octopus cyanea fishery, which is economically the most important fishery in southwest Madagascar (Raberinary and Benbow, 2012) and an important component of the Velondriake Locally Managed Marine Area (LMMA) network in south-west Madagascar (Harris, 2007; Benbow et al., 2014). An integrated conceptual model of the octopus fishery (Figure 7) was developed in a participatory workshop setting with stakeholders, who selected this example because of its socio-economic importance, and also because it may offer an opportunity under climate change given that temperature has a direct positive effect on the growth rate of octopus within its thermal tolerance range (Andre et al., 2009) and hence this fishery is expanding. Figure 7. Conceptual model for octopus developed collaboratively with workshop participants and illustrating linkages between climate and biological variables, as well as economic and social considerations, hence necessitating an integrated interdisciplinary approach for assessing vulnerability and planning adaptation strategies. 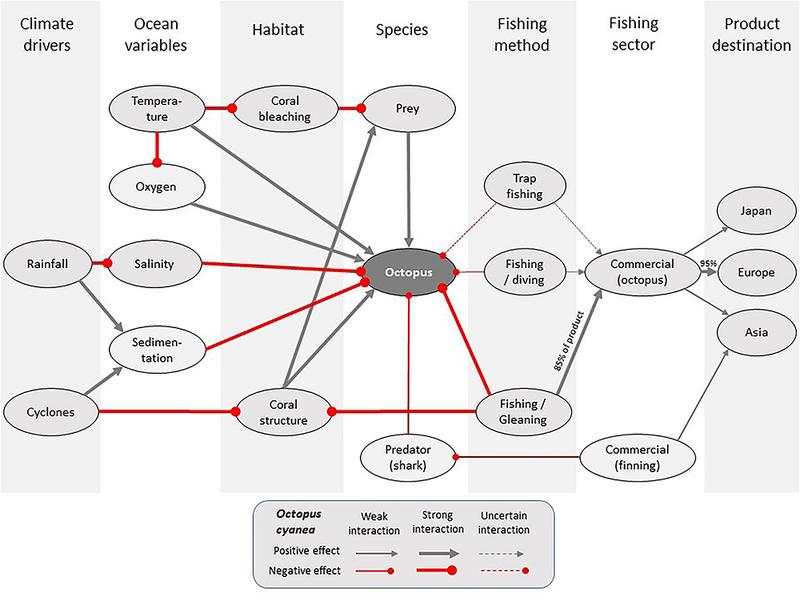 The conceptual model formed the basis of a more formalized octopus model that highlighted the complexity of interactions and drivers in the coupled climate-fishery-human users system (Figures 7, 8). A number of physical climate variables were identified that potentially impact on the octopus, with many of these impacts indirect. For example, even though temperature has a positive effect on octopus growth rates, temperature will lower oxygen levels, which has a negative effect on octopus. Another example of an indirect effect is where rainfall influences salinity, which negatively affects octopus, which may then take refuge in deeper water and be less accessible to fishers. If rainfall increases and hence runoff increases, poor land management practices can exacerbate problems in the marine environment, for example increased sediments reducing visibility for visual predators such as octopus. Participants also identified an indirect negative effect whereby elevated temperatures result in coral bleaching and hence negatively impact the prey and essential habitat of octopus. Similarly, cyclones indirectly impact octopus negatively through damage to coral structures that they rely on. Figure 8. Formalized octopus model showing qualitative interactions (negative and positive). This formalized model with complete feedback system would form the basis of a qualitative model enabling stability analysis to simulate alternative future climate change scenarios. An important relationship between the health of coral structures and the method of fishing was also identified. Gleaning activities, where fishers walk over the reef, cause damage to the coral structures and hence adversely affect octopus too. This was seen as a critical link for adaptation options that would not only enhance the current status of the octopus resource but also build resilience to future climate change impacts. In some regions, progress has already been made in implementing fishing methods (e.g., traps) that reduce negative impacts on coral structures when harvesting resources. Discussion also focused on the design of traps, highlighting, for example, that if lighter traps with flotation devices could be developed that do not require setting from a boat this would ensure that women, who may not have access to a boat, could set traps in shallow regions and would not be excluded from this activity. The development of a conceptual model as in Figure 8 was helpful in synthesizing an integrated understanding of the octopus fishery, and as a starting point for more complex dynamic models that could be run to evaluate and compare the effectiveness of alternative management strategies under future climate change scenarios. It was noted that it would also be advantageous to develop spatial models to explore the potential benefits of alternative spatial and temporal closure regimes. This seemed particularly relevant because different segments of society were active in this fishery in different parts of the country (i.e., women and children in the south-west and families more generally in the north-east). The impact of closures could therefore affect families in different ways depending on where they were. Workshop participants agreed that the octopus fishery provides a useful example of a potential climate change winner (i.e., not all climate change impacts are negative) and hence that careful management at all levels is necessary to ensure that communities continue to benefit from optimal use of this resource without negatively impacting the future sustainability of the octopus fishery. Recently Cinner et al. (2016) identified characteristics considered necessary to sustain healthy ecosystems in the face of changing environmental conditions and socioeconomic drivers, with so-called “bright spots” identified as places where ecosystems are substantially better than expected as a result of characteristics such as traditional systems of sea tenure and management being functional or partially functional. Madagascar’s octopus fishery was considered to have several of these characteristics, including well-established tenure systems, engagement, strong dependence and a deep water refuge (where it moves to spawn). The integrated assessment of the study area as a whole indicates widespread moderate and high vulnerability throughout the system (Figure 9) and must give cause for concern. This generally negative assessment is to be expected given the many challenges facing coastal communities in Madagascar and the country as a whole. Key factors that are shown to increase the vulnerability of the country are that it is vulnerable to changing ocean conditions, exacerbated by the fact that Madagascar is an island, its heavy dependence on renewable natural resources for livelihoods; and weaknesses in management, governance and the wider economy. The results demonstrate that, while local communities are assessed here to be neutral in terms of vulnerability (i.e., neither weak nor strong, vulnerable nor resilient), their dependence on a highly vulnerable ecological base and the weaknesses of governance in addressing the threats to that base, and providing alternatives, pushes them into a condition of higher vulnerability (Figure 9). Figure 9. General vulnerability and resilience of fisheries-dependent communities on the north and west coast of Madagascar, determined using the logic rules method for aggregation of scores. See also the alternative method using means (Supplementary Figure S1). HDI, Human Development Index; MDI, Multidimensional Poverty Index (UNDP, 2015). The results shown in Figure 9 are from the logic rules approach to aggregating scores (see Integrated Assessment of Vulnerability of Coastal Communities in the North and Western Regions of Madagascar to Climate Change under Methods). The alternative method for aggregating scores, calculating arithmetic means, produces an apparently less severe set of results: all of the composite indicators are estimated as showing moderate negative impact or vulnerability (Supplementary Figure S1). The difference between the two methods is essentially that the logic rules assume that a minority of extreme scores will tend to dominate the vulnerability (or resilience) of composite indicators, while the arithmetic means method assumes that impacts will be averaged and that, for example, a high impact threat will be canceled out by a high positive impact or resilience within the same composite indicator. A consequence of using the means could be that the results tend to show a reversion to the mean, in which there is a tendency for a distribution to shift toward the mean with additional sampling (Samuels, 1991). The reality will depend on the specific circumstances in each case, and for decision-making the reasons for differences in scores from the two methods need to be understood in order to decide which is the more realistic. While every effort was made to ensure that the structure of and information used in the integrated assessment are accurate and appropriate, the scores are considered preliminary. They should be at least indicative of impacts and vulnerabilities but are presented here primarily as a demonstration of the method. A rigorous review of the scores by stakeholders, managers and scientists is recommended before being used in decision-making in planning future research and management engagement. The workshop on education and communicating ocean science, and the curricula materials presented there, were well received by the participants, as evidenced by the feedback provided during their reflections on their experiences (GLORIA, 2016). The participants were asked to answer anonymously two or three questions at the end of the workshops. When asked what the participants would like to take back and try in their own classrooms, they expressed interest in creating authentic learning opportunities to transform the way students learn and think about science. Moreover, teachers participating in the workshop became convinced that they should, and were confident that they could, provide hands-on science experiences for their elementary students. Many participants conveyed that the workshops gave them (1) the resources and knowledge they needed to teach about the ocean and climate and connect it to their local environment; and (2) that they would like to use the hands-on inquiry-based activities introduced in the workshops to help their students learn effectively. Many participants said they would try new methods of teaching and facilitation to promote: student-centered exploration, exchange of ideas with peers through group work, and deeper understanding through reflection. It was clear from examination of the available information and the discussions with local participants that, in general, the major challenges that are confronting coastal communities in Madagascar, including the climate-related challenges, are already recognized by local scientists and management agencies and have been recorded in earlier and ongoing work and publications by government, NGOs and academic institutions in Madagascar. The details of how these challenges impact specific communities and fisheries, the full range and interactions between them and implications of these challenges are often less well understood, however. The primary focus of the GLORIA project was to explore and discuss methods that would help to identify, understand and address these site-specific details. Through this, some preliminary results were also obtained on the drivers, their impacts and adaptation options. The GLORIA initiative was considered useful and successful by those who participated in it. The preparations for and implementation of the main workshop demonstrated that there is considerable information and sources of experience and expertise on climate change and coastal communities in Madagascar but it tends to exist in pockets and the different elements are rarely brought together and integrated. Such integration is essential for provision of reliable and pertinent information for planning, strategic and tactical management and governance. Perhaps because of this, while all of the methods and approaches were well received and supported, there was particularly strong interest amongst this group in analytical methods, such as the different modeling exercises and GIS-based mapping, that provide tools to integrate often dispersed but inter-related local to global information. Another general observation from the project, demonstrated by the engagement and enthusiasm of the participants, was a reinforcement of the importance of undertaking vulnerability assessments and developing adaptation options in consultation with stakeholders, rather than as an academic exercise. The input from local participants in the project enriched the analyses and outcomes, ensuring they remained rooted in the local realities. The project also validated a principle underpinning GLORIA, which is that it is insufficient to consider individual stressors and drivers on marine-dependent communities in isolation and that their cumulative impacts must be addressed, including the additive impact of climate change in combination with other stressors. It is essential to consider, from an integrated perspective, the specific vulnerabilities, needs and opportunities pertaining to each particular community or fishery system in order to develop options that are feasible, acceptable and likely to fulfill their goals. Determining exposure to climate-driven impacts is the starting point for assessing the vulnerability of a community or region but, particularly in many developing countries, information on climate drivers is often scarce and incomplete. There is no doubt that reliable higher resolution, regional models can, in general, provide better representation than global models of key regional features (Popova et al., 2016b; Ortega-Cisneros et al., 2018a), but the development of regional models is costly and the capacity to do so is not always available in developing regions. Information from global models can be particularly useful in such cases for forecasting future trends, and the goal of the GLORIA project was to identify, from the very complex outputs from global models, indicators that are most relevant to local needs. This was achieved by working closely with the diverse stakeholders and bringing expertise in and outputs from global climate models together with local experience and knowledge. This approach could usefully be applied in other countries and regions that do not have access to and the capacity to work with tailored regional models. Work and information on the vulnerability of marine species in Madagascar has been limited and has focused mainly on coral reef associated species (Harding, 2013). Inclusion of the traits-based ecological risk assessment described here as a standard component of ecological vulnerability assessments and applied across the full range of socio-ecologically important species, would considerably strengthen the current set of indicators used to estimate ecological sensitivity of Malagasy coastal communities and ecosystems. The project applied a range of different tools and approaches in preliminary assessments of the human constituents of vulnerability and toward adaptation planning, all of which focused on ensuring strong participation by local communities and stakeholders. The results from the fieldtrip were presented to and discussed by participants at the workshop in Antananarivo, at which lively and enthusiastic discussions provided further information on, for example, ecological use areas and long term patterns of change, as well as confirming the results from the field trip. Surveys such as those reported here could contribute, in future, to the identification of targeted and valuable species and bring insight into historical dynamics and evolution of important stocks. Fisher and community perceptions on the changes in fish stocks could be compared to the outputs of ecological vulnerability assessments for a measure of ground-truthing. The identification of perceptions provided valuable insights into the key changes that were being experienced by communities and revealed considerable differences in the perceptions and responses of the two communities covered in the field trip, despite their relative proximity to each other. This is consistent with the results from, for example, Cinner et al. (2012), which showed considerable differences in sensitivity and adaptive capacity between different communities within the same country. These results demonstrate the importance of considering each community in its own right starting with the details of the design of the vulnerability assessment (Aswani et al., 2018) through to adaptation planning and action. It also became clear that in order to assess which groups and individuals will be most vulnerable to future changes there is a need for greater understanding of the wellbeing of people at the present time and how this is related to the environment and ecosystem services. A more contextualized understanding of ecosystem-wellbeing relationships would make it easier to plan and prepare for future environmental change impacts on those stakeholders most in need and most vulnerable. The approaches applied also highlighted that there is a need for more participatory scenario-based approaches to understanding vulnerability to future environmental change (e.g., Leith et al., 2013). In contrast to many predictions and models, scenarios explicitly confront uncertainty of future events and hence can be more resilient to surprises (Alcamo, 2008; Palomo et al., 2011). Given the multitude of environmental and non- environmental factors that will interact to moderate the future vulnerability of coastal communities to environmental change, such an approach will be vital in developing future management plans and promoting appropriate adaptation strategies. Understanding supply chain mechanics and structure for species of economic, social or cultural importance is key in all vulnerability assessments. New supply chain opportunities for local fishing communities disadvantaged by climate impacts could potentially be developed, helping to ensure food security and improving welfare of fishing communities (De Silva, 2011), and need to be explored in Madagascar. From the literature around supply chain assessment in developing countries, it is apparent that strengthening of weak financial structures, focusing on formal financial systems, reducing power imbalances in the governance structures, and resolving socio-cultural and environmental concerns are major priorities (De Silva, 2011), and Madagascar is no different. The role of women in both the catch sector and operating as fish collectors also needs special consideration. In addition to qualitative descriptions of supply chains, a number of new and more structured approaches are useful for their analysis. In the workshop, participants recognized the value of mapping supply chains in a consistent manner, which allows for application of new analytical tools, such as supply chain indices, for identifying critical vulnerabilities (Plaganyi et al., 2014). This will be key for effective climate adaptation. 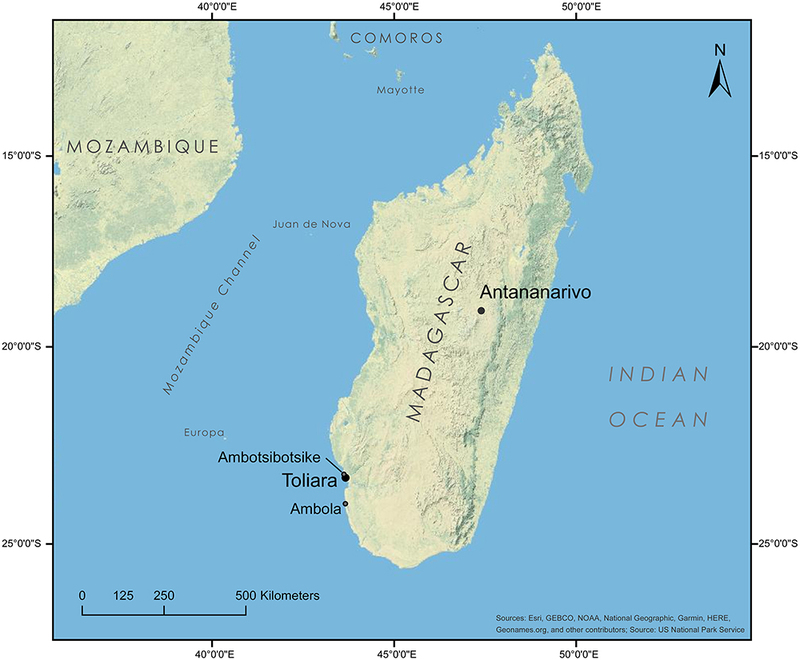 Production of qualitative models of the marine and coastal ecosystems of Madagascar, as undertaken in the GLORIA project, will facilitate cross-comparisons with other similar southern hemisphere ecosystems, and particularly other hotspot regions. Conceptual and qualitative models can also facilitate the future development of more complex marine system models to support natural resource management in the region. There were insufficient data available on the crab and octopus fisheries to parameterize quantitative models, but as more data become available, more complex MICE models that are fitted to data (see e.g., Morello et al., 2014; Babcock et al., 2016) could be developed. Quantitative models of increasing complexity can be built in a step-wise fashion and then used to compare the effectiveness of alternative management strategies, which will be useful for adaptation planning in Madagascar and in general. The development of a toolbox of modeling approaches that includes conceptual, qualitative and quantitative models (Smith et al., 2007) to support integrated decision making was encouraged by participants. A key requirement is to collect data on key resources harvested and, especially, to establish total amounts removed. As a starting point for use in estimating key parameters through fitting to data in a dynamic model, catch-per-unit-effort could be used as an index of abundance (see e.g., Plaganyi et al., 2014). Obtaining sufficient information and data to validate fully the methods described here is challenging in most regions of the world, especially in many developing countries. However, our study demonstrates the utility of rapidly constructing an integrated framework as a starting point, to highlight key connections, guide ongoing data collection and inform thinking on adaptation and resilience building. Despite the absence of formal validation, insights gained from these methods can provide useful information for preliminary action and decision-making, provided they are applied in a precautionary manner, recognizing the uncertainties, and within an adaptive process that enables adjustments to be made as knowledge is improved. Ultimately more complex quantitative analyses, as new information becomes available, will increase the reliability and depth of insights to be gained from an analysis. An advantage of starting with a broad integrated framework that maps all potential system interactions based on stakeholder inputs, is that important drivers and connections are captured rather than risking these being overlooked because of more narrow data constraints. The conceptual model, or framework (Figure 9), was developed and applied as a means of synthesizing the different aspects of the vulnerability assessment at a broad geographical scale encompassing the north and western coasts of Madagascar. At this scale the results should help to highlight those drivers and issues likely to be of higher priority and can provide a useful starting point for more in-depth consideration at higher resolutions. The same framework can be adapted and scored for different scales and localities, including individual sectors or communities, to formulate an integrated and synthesized vulnerability assessment to inform more detailed planning and implementation. The integrating framework combined aspects of the standard IPCC framework (e.g., Marshall et al., 2009) with a bottom–up, participatory approach implemented within the context of a rapid assessment. A risk of this pragmatic, rapid and participatory approach is that some important drivers and indicators may be over-looked or the detailed information necessary, for example, to differentiate between elements of sensitivity and elements of ecological adaptive capacity (or recovery potential), may not be available (cf. e.g., Cinner et al., 2013). This risk was reduced in the project as far as possible through the scope of the different activities and the diverse backgrounds and experience of the participants. The primary advantage of the GLORIA approach is that it provides structured methods for the different components of a holistic assessment, while allowing for the development of an integrated framework on the basis of available information and substantiated stakeholder input. As such, it leads to the co-production of knowledge in which managers, scientists and stakeholders can “interact to define important questions and relevant evidence…. and engage in joint deliberation…” (Berkes, 2009, p. 65). The GLORIA project went some way toward doing this and, given time and resources, the process started by GLORIA should be continued to increase knowledge of drivers, sensitivity and adaptive capacity and options at all scales. The education model applied here (see Communicating Ocean Science and Climate Change) is scalable and transferable, and builds on collaborations between scientists and educators to increase their capacity to share locally relevant climate knowledge through highly effective education and outreach efforts. It helps to increase broad understanding by stakeholders of the changes that are taking place around them, building awareness and providing contextualized education on these changes, which are fundamental to strengthening resilience. In this regard, there would be value for Madagascar, and other countries in the western Indian Ocean region and beyond, in implementation of a program drawing on this model to improve climate literacy and to provide society with the scientific foundation to take informed actions to minimize climate impacts and prepare for changes that are already well underway. When the results and conclusions from the different activities undertaken by the project are brought together, what emerges is a picture of communities that are not inherently particularly vulnerable but are being squeezed between, on the one hand, climate and fisheries impacts on the resource base and, on the other, weak management and governance at local and national scales. Capacity strengthening at all levels of government, from local to national, would seem to be an urgent requirement for Madagascar to support and enable coastal communities to meet the climate and other challenges that currently confront them. A similar conclusion was reached by Blythe et al. (2014) for coastal communities in Mozambique. Strengthening of fisheries management in countries such as these needs to be done in a way that is achievable with available capacity, developing primary management strategies that are feasible, appropriate and effective under the circumstances (Cochrane et al., 2011a). Nevertheless, there are some encouraging aspects that emerge from the results that suggest opportunities for adaptation and strengthening resilience. While the fishery resources are under pressure (Harding, 2013), a relatively low proportion of key species was found to be highly sensitive to climate change, while the inshore marine environment appears still to be productive at present and in a reasonable state. With good management, resources could be restored to or maintained at productive levels. Nevertheless, potential climate impacts on the environment, such as coral bleaching, present a major challenge to maintaining or restoring fishery resources. Communities demonstrate some adaptive capacity, and alternative livelihoods in tourism and aquaculture could enable some level of added resilience. State support to communities to take advantage of these opportunities is likely to be limited, however, as indicated by the status of the general supportive environment and government effectiveness. The results obtained on the threats from climate drivers are supported by information from other studies. A recent assessment conducted under the auspices of the World Bank found that between 1964 and 2014, the south western Indian Ocean island (SWIO) states of Comoros, Madagascar, Mauritius and the Seychelles were impacted by 100 significant adverse natural events (World Bank, 2017). Of these, tropical cyclones were found to account for approximately 85% of the average annual loss per year of USD 100 million experienced by Madagascar as a result of all adverse natural events. The World Bank study noted that there has been an increasing trend in the frequency and intensity of extreme weather related events across the SWIO region and that the effects of climate variability and change add to the challenges already being faced by countries in the region. Also reinforcing the findings from this study, Harding (2013) reported that climate change is likely to lead to changes in abiotic features of the marine and coastal environments in Madagascar, including SST, salinity, pH, cyclonic activity and sea level, while the country’s coral reefs can be expected to be severely degraded by 2050 as a result of coral bleaching and ocean acidification and the mangrove ecosystems could also be seriously impacted by rising sea levels and changes in precipitation. Coastal communities will also have to deal with substantial impacts from non-climate related developments, including a growing population and escalating demand for seafood for subsistence, over-exploited coastal resources and impacts of land-based activities on the coastal environment (ASCLME, 2012; Harding, 2013; this study). Results from the assessments of impacts of climate change on social and governance aspects of coastal communities undertaken in this study, including the conceptual modeling exercises, demonstrated that climate-driven changes to habitats will have knock-on effects on fisheries’ target species that are dependent on those habitats and the coastal communities that rely on them for livelihoods, representing a serious threat to their food security. Consistent with these results, Harding (2013) concluded that high dependence on coral reefs for livelihoods, generally low adaptive capacity, already overexploited fishery resources and degraded habitats led to high vulnerability of coastal communities on the west coast of Madagascar and in some communities in the north of the country that were particularly dependent on coral reef resources. The Beheloke community in southwest Madagascar, was found by Gough (2012b) to be utilizing a range of fishery resources occupying different habitats, which led her to conclude that this community was less sensitive to climate change than communities that are heavily dependent on coral reef associated species. Nevertheless, because of the high dependence of the community on fisheries and, with few other livelihood opportunities, they were still considered to be highly sensitive to changes in availability and abundance of the resources. An assessment of the vulnerability of coastal communities in five countries in the western Indian Ocean region yielded results that showed some differences to those from the Harding (2013) review but led to a similar overall assessment (Cinner et al., 2012). The Cinner et al. (2012) study found that coral reefs in north-west Madagascar are highly exposed to risks of coral bleaching but that those in southwest Madagascar are exposed to lower sea water temperatures and are therefore less vulnerable. The authors of that study also concluded, however, that the communities from Madagascar included in the study had relatively low average adaptive capacity and that, of the five countries examined, Madagascar had the second highest overall vulnerability to climate change impacts on coral reef fisheries. Sahamalaza, in northwest Madagascar, was estimated to be the most vulnerable of the 29 communities covered in that study (Cinner et al., 2012). The results of the GLORIA project reinforced the critical importance of considering the cumulative impacts of individual stressors and drivers across the full socio-ecological system, both climate-related and others, when assessing vulnerability of marine-dependent communities. Such assessments and adaptation planning should not only consider the past and present but also be forward-looking and consider likely changes in the future. Participation by local experts and stakeholders is essential, enabling knowledge exchange while also contributing to local capacity-building, generating a sense of ownership, ensuring local knowledge is fully taken into account and that outputs are accepted by stakeholders as being legitimate. KC was the lead author and responsible for overall development and assimilation of the paper. HR made important contributions to the local input into the project and manuscript. EPo, GP, WS, SA, TC, EvP, EPl, and AP were responsible for writing sections on specific themes as in the subsections of the Materials and Methods and Results sections. They were particularly supported by ND-B, AL, VB, MG, SvG, WM, AR, LS, and PT. The other authors made important contributions to the contents of the paper during the workshop and contributed to the final product. Ecosystem Services for Poverty Alleviation (ESPA), Edinburgh, United Kingdom is thanked for financial support that made this project possible. This publication is also a contribution to the Belmont Global Understanding and Learning for Local Solutions (GULLS) project, the concept for which was developed in discussions within the Global Marine Hotspots Network. The authors wish to recognize Belmont country partner funding provided by National and Regional Science Agencies, including CSIRO (Australia), FAPESP 2012/51873-1 (Brazil), NRF (South Africa), and NERC (United Kingdom). GP was supported by an ARC Future Fellowship. All of the participants at the workshop are thanked for their time and invaluable contributions. WWF Madagascar provided excellent support for the logistics of the Antananarivo workshop and communication with local stakeholders and WWF Madagascar and IH.SM, Toliara (Institut Halieutique et des Sciences Marines) provided invaluable technical and scientific information in the preparations for and during the workshop. Fania Rakotonirina and José Randrianandrasana are thanked for their assistance with translation. Alcamo, J. (2008). Environmental Futures: The Practice of Environmental Scenario Analysis, Vol. 2. Amsterdam: Elsevier Science, 212. ASCLME. (2012). National Marine Ecosystem Diagnostic Analysis. Madagascar. Contribution to the Agulhas and Somali Current Large Marine Ecosystems Project. New York, NY: UNDP & GEF. Brander, K., Cochrane, K., Barange, M., and Soto, D. (2018). “Chapter 3. climate change implications for fisheries and aquaculture,” in Climate Change Impacts on Fisheries and Aquaculture: A Global Analysis, eds B. F. Phillips and M. Perez-Ramirez (Oxford: Wiley-Blackwell), 45–62. Burke, L., Reytar, K., Spalding, M., and Perry, A. (2011). Reefs at Risk Revisited. Available at: http://www.vliz.be/en/imis?refid=223234 [accessed October 19, 2016]. Caputi, N., Feng, M., Pearce, A., Benthuysen, J., Denham, A., Hetzel, Y., et al. (2015). “Management implications of climate change effect on fisheries in Western Australia, Part 1: environmental change and risk assessment,” in FRDC Project No. 2010/535. Fisheries Research and Department of Fisheries, Western Australia, Canberra, 180. Cochrane, K., De Young, C., Soto, D., and Bahri, T. (eds) (2009). “Climate change implications for fisheries and aquaculture: overview of current scientific knowledge,” in FAO Fisheries and Aquaculture Technical Paper. No. 530, (Rome: FAO), 212. Cochrane, K. L., Emerson, W., and Willmann, R. (2011b). “Sustainable fisheries: the importance of the bigger picture,” in Sustainable Fisheries: Multi-level Approaches to a Global Problem, eds W. W. Taylor, A. J. Lynch, and M. G. Schechter (Bethesda, MD: American Fisheries Society), 3–19. De Silva, D. A. M. (2011). Value Chain of Fish and Fishery Products: Origin, Functions and Application in Developed and Developing Country Markets. Rome: Food and Agriculture Organization. FANRPAN (2014). A Comprehensive Scoping and Assessment Study of Climate Smart Agriculture (CSA) Policies in Madagascar. Washington, DC: FANRPAN. Gough, C. (2012a). Methods for Assessing the Vulnerability of Traditional Fisheries to Climate Change: Part of the Capacity for Adaptation to Climate Change, Madagascar. Gland: WWF. Gough, C. (2012b). Assessment of the Vulnerability of the Traditional Fisheries of Beheloke to Climate Change: Part of the Capacity for adaptation to Climate Change, Madagascar. Gland: WWF. Harding, S. (2013). “An assessment of the vulnerability of small-scale fisheries in Madagascar to climate change,” in Proceedings of the WWF Madagascar & Western Indian Ocean Program Office, ed. S. Harding (London: Blue Ventures Conservation). Harris, A. (2007). To live with the sea -development of the velondriake community-managed protected area network, south West Madagascar. Madagascar Conserv. Dev. 2, 43–49. Hobday, A. J., Alexander, L. V., Perkins, S. E., Smale, D. A., Straub, S. C., Oliver, E. C., et al. (2016a). A hierarchical approach to defining marine heatwaves. Prog. Oceanogr. 141, 227–238. IPCC (2013). “Chapter 14: climate phenomena and their relevance for future regional climate change,” in Climate Change 2013: The Physical Science Basis. Contribution of Working Group I to the Fifth Assessment Report of the Intergovernmental Panel on Climate Change, eds T. F. Stocker, D. Qin, G.-K. Plattner, M. Tignor, S. K. Allen, J. Boschung, et al. (Cambridge, MA: Cambridge University Press). Kahane, A. (2012). Transformative Scenario Planning: Working Together to Change the Future. New York, NY: Berrett-Koehler Publishers, 168. Lavitra, T., Rachelle, D., Rasolofonirina, R., Jangoux, M., and Eeckhaut, I. (2008). Processing and marketing of holothurians in the Toliara region, southwestern Madagascar SPC Beche de Mer. Inform. Bull. 28, 24–33. Levins, R. (1998). “Qualitative mathematics for understanding, prediction, and intervention in complex ecosystems,” in Ecosystem Health, eds D. Raport, R. Costanza, P. Epstein, C. Gaudet, and R. Levins (Cambridge, MA: Blackwell Science), 178–204. McVean, A. R., Hemery, G., Walker, R. C. J., Ralisaona, B. L. R., and Fanning, E. (2005). “Traditional sea cucumber fisheries in southwest Madagascar: A case-study of two villages in 2002,” in Proceedings of the SPC Beche-de-mer Information Bulletin, (Nouméa: Coastal Fisheries Programme). Obura, D. O., Church, J. E., and Gabrié, C. (2012). Assessing Marine World Heritage from an Ecosystem Perspective: The Western Indian Ocean, World Heritage Centre, United Nations Education, Science and Cultural Organization. Paris: UNESCO, 124. Popova, E., van Gennip, S., Byfield, V., and Yool, A. (2016a). Madagascar and the Mozambique Channel. Climate Change Indicators Relevant to Living Marine Resources. Southampton: National Oceanography Centre, 13. Pörtner, H. O., Karl, D., Boyd, P. W., and Cheung, W. (2014). “Ocean systems,” in Climate Change 2014: Impacts, Adaptation, and Vulnerability. Part A: Global and Sectoral Aspects. Contribution of Working Group II to the Fifth Assessment Report of the Intergovernmental Panel on Climate Change, eds C. B. Field, V. R. Barros, D. J. Dokken, and K. J. Mach (Cambridge, MA: Cambridge University Press), 411–484. Preston, B. (2012). “Climate change vulnerability assessment: from conceptual frameworks to Practical heuristics,” in Proceedings of the CSIRO Climate Adaptation Flagship Working Paper No.16, (Canberra: CSIRO). Rasolofonirina, R. (2007). “Chapter 4: Sea Cucumbers in Madagascar,” in Commercial Sea Cucumbers: A Review for the Western Indian Ocean, eds C. Conand and N. A. Muthiga (Zanzibar: WIOMSA). Rasolofonirina, R., and Conand, C. (1998). “Sea cucumber exploitation in the Toliara region of southwest Madagascar,” in SPC Beche-de-Mer Information Bulletin, (Nouméa: Coastal Fisheries Program), 10–13. Rasolofonirina, R., Mara, E., and Jangoux, M. (2004). “Sea cucumber and mariculture in Madagascar, a case study of Tuléar, south-west Madagascar,” in Advances in sea Cucumber Aquaculture and Management. Fisheries Technical Paper No. 463, eds A. Lovatelli, C. Conand, S. Purcell, S. Uthicke, J. F. Hamel, and A. Mercier (Rome: Food and Agriculture Organization of the United Nations), 133–149. Rocliffe, S., and Harris, A. (2015). “Scaling success in octopus fisheries management in the Western Indian Ocean,” in Proceedings of the Workshop, (Stone Town). Rocliffe, S., and Harris, A. (2016). The Status of Octopus Fisheries in the Western Indian Ocean. London: Blue Ventures. Samuels, M. L. (1991). Statistical reversion toward the mean: more universal than regression toward the mean. Am. Stat. 45, 344–346. UNDP (2015). Human Development Report (2015) Work for Human Development. New York, NY: United Nations Development Program. UNFCCC (1992). United Nations Framework Convention on Climate Change. Available at: https://unfccc.int/resource/docs/convkp/conveng.pdf. Welch, D. J., Saunders, T., Robins, J., Harry, A., Johnson, J., Maynard, J., et al. (2014). Implications of Climate Change on Fisheries Resources of Northern Australia. Part 1: Vulnerability Assessment and Adaptation Options. Bengaluru: FRDC. World Bank (2017). South West Indian Ocean risk Assessment and Financing Initiative (SWIO-RAFI) : Summary Report. Washington, DC: World Bank Group, 35. Copyright © 2019 Cochrane, Rakotondrazafy, Aswani, Chaigneau, Downey-Breedt, Lemahieu, Paytan, Pecl, Plagányi, Popova, van Putten, Sauer, Byfield, Gasalla, van Gennip, Malherbe, Rabary, Rabearisoa, Ramaroson, Randrianarimanana, Scott and Tsimanaoraty. This is an open-access article distributed under the terms of the Creative Commons Attribution License (CC BY). The use, distribution or reproduction in other forums is permitted, provided the original author(s) and the copyright owner(s) are credited and that the original publication in this journal is cited, in accordance with accepted academic practice. No use, distribution or reproduction is permitted which does not comply with these terms.